« How Social Media Was Cited in Impact Case Studies? 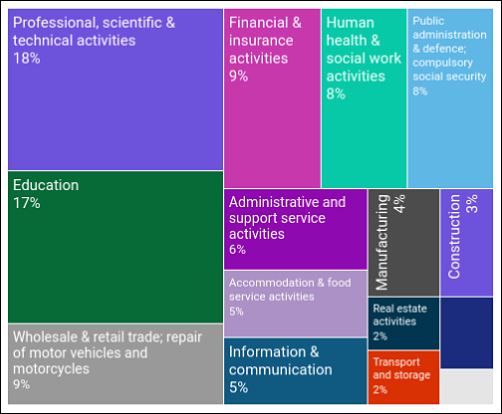 “What are you going to do with that degree?” is a common question asked of young people considering studying in many areas, from most of the social sciences and humanities to some esoteric physical sciences. The underlying implication of the question is that there’s unlikely to be a happy career outlook for graduates in that discipline, so why not take something more practical. A new report from Britain’s Campaign for Social Science, Positive Prospects: Careers for Social Scientists and Why Data and Number Skills Matter, argues that at least for the social sciences, graduates in the United Kingdom can find work and will make as much as the body of physical science and technology graduates that are held up as the most marketable. Given that almost 40 percent of British undergraduates obtain a social science degree, these are important findings to bolster public confidence and government support for social and behavioral study. The report’s data are drawn from Higher Education Statistics Agency (HESA) evidence gathered about students who graduated in 2015-16. 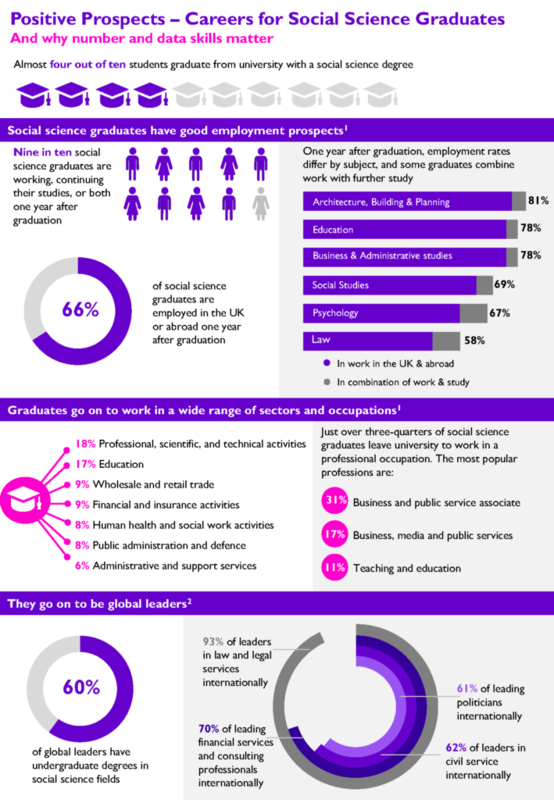 Positive Prospects in turn updates an earlier Campaign report, What do social science graduates do?, from 2013. … Positive Prospects highlights another message too. If undergraduates have number and data skills – either acquired at schools or as part of their undergraduate studies – they are likely to have a wider range of choices and possibly to earn more. In other words, these skills add a dimension that is valued by employers. This is not, of course, to say that number and data skills are the only thing that matters, or that all social science undergraduates need the same level of such skills. But it does show that having these skills offers additional opportunities to those who have them. Reflecting that, a series of recommendations that conclude the report focus on improving maths and statistics competency at education institutions and among social science students. 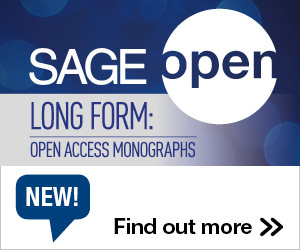 The authors take a broad view of what constitutes social science, and in addition to traditional fields such as sociology, geography, psychology, political science and economics, include fields like finance, law, accounting and architecture. The inclusion of accountancy and law do influence the earnings conclusions, since long with economics these are the top three of the ‘social science’ fields in estimated earnings. Of course, earnings only matter for those who can get jobs. Positive Prospects finds that “when we look at the big picture – at the social sciences, the other sciences, and the arts and humanities – the employment rates of graduates from UK universities do not differ significantly from one another a year after graduation.” Using HESA data, the authors say that 66% percent of full-time first-degree students in the social sciences were employed with a year of graduation. For the physical and natural sciences, in comparison, the figure is 70 percent and for the arts and humanities, 66 percent. Factor in those who intentionally didn’t seek work in the year after graduation and those who launched directly in further study, and only 5 percent of social science graduates reported being unemployed – the exact same as the other sciences. To download the full report, click here. 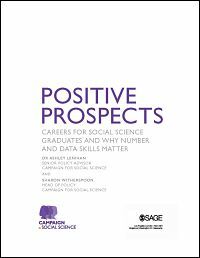 Positive Prospects is published by SAGE Publishing, which is the parent of Social Science Space. This entry was posted in Career, Communication, Impact and tagged Campaign for Social Science, Positive Prospects. Bookmark the permalink. Post a comment or leave a trackback: Trackback URL.